I don’t know about you, but I’m glad to see the (politically correct here) Christmas/Chanukah/Kwanzaa/etc. season finally arrive. I have had my fill of pumpkins for this year, and I’m ready for shiny and bright! Thankfully, we have a number of Christmas parties planned here at home for which I can pull out all the decorating stops…or show restraint. (Yeah, right! That’ll happen! 🙂 ) The master plan is to make each one unique in style, content, and color scheme. We’ll see how that works out since I am so partial to red during the holiday season! This first party of the 2010 Christmas season came right on the heels of Thanksgiving which didn’t allow for a lot of prep time. I had to think fast on my feet! Mercifully, the long tables were already in the living room, Ramon hustled to finish the outdoor lighting (all red, of course! ), and the house was already clean. To further maintain my sanity, I opted to share cooking duties with a favorite caterer. Our garage has morphed into a floral cooler (!!! ), so lots of fresh greenery there to grab and arrange at a moment’s notice. (I don’t even want to discuss the bad “haircut” our porch evergreens got in the name of floral design for the small arrangements! 😦 ) At any rate, this dinner party kicked the season off with a bang! Try as I may to avoid it, red makes its way into almost every holiday setting I create. 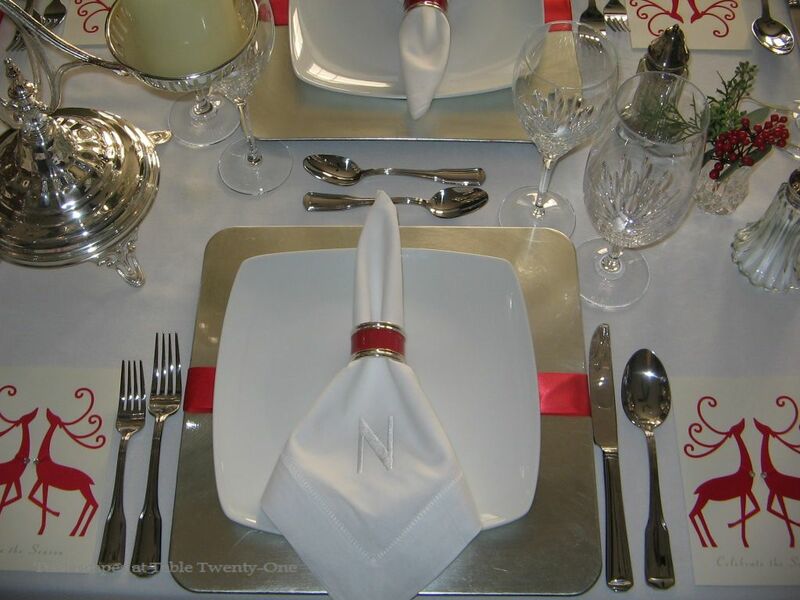 Icy silver and white play host here to fiery red on a table set for 12. Muted silver square chargers (Old Time Pottery) with rounded edges anchor the place setting. 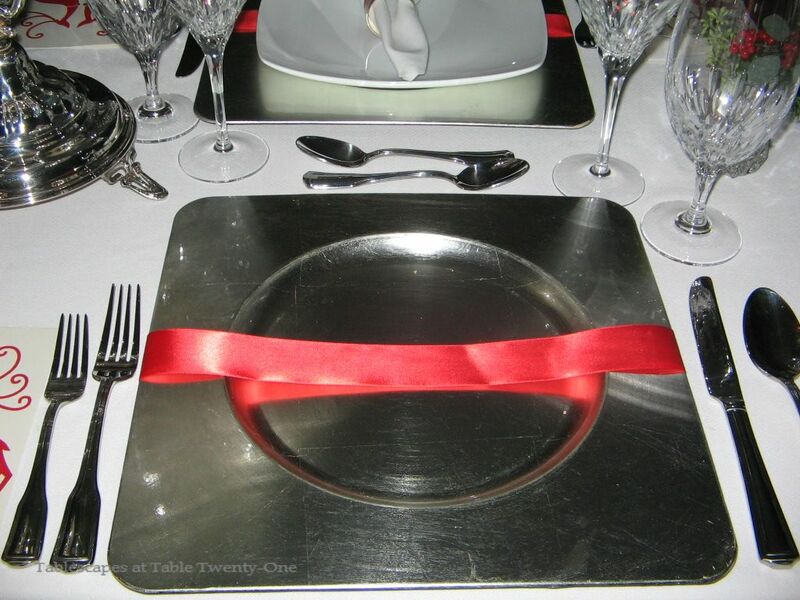 A rounded-edge square B. Smith with Style plate in frosty white is then topped with a crisp white dinner napkin encircled with a red & silver ring to keep the napkin from disappearing into the plate. Godinger crystal stemware from the “Chelsea” collection and Hampton Silversmiths “Patriot” flatware round out the setting. A simple length of satiny red ribbon is tucked around the charger to give the illusion of a “gift” and to add a little color. This photo was taken a bit later in the evening, but I think it shows how beautifully the crisp white shows up to the darkness. It, like the tablecloth, reminds me of snow! I wanted to add a bit more red and introduce something a little fun to the table. 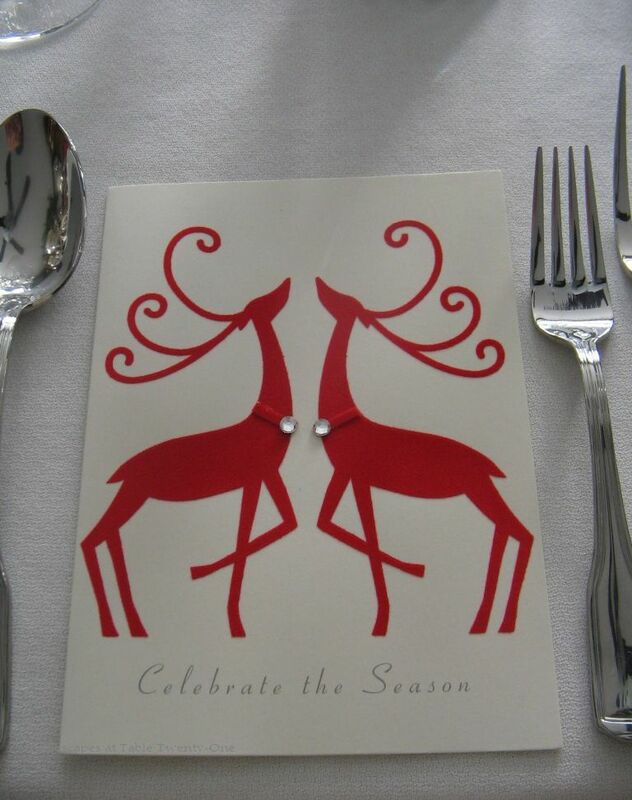 I settled on these beautiful Christmas cards from Pier 1. I have 3 of these lovely silver epergnes, and liked the way they looked like pretty soldiers lining the center of the table! 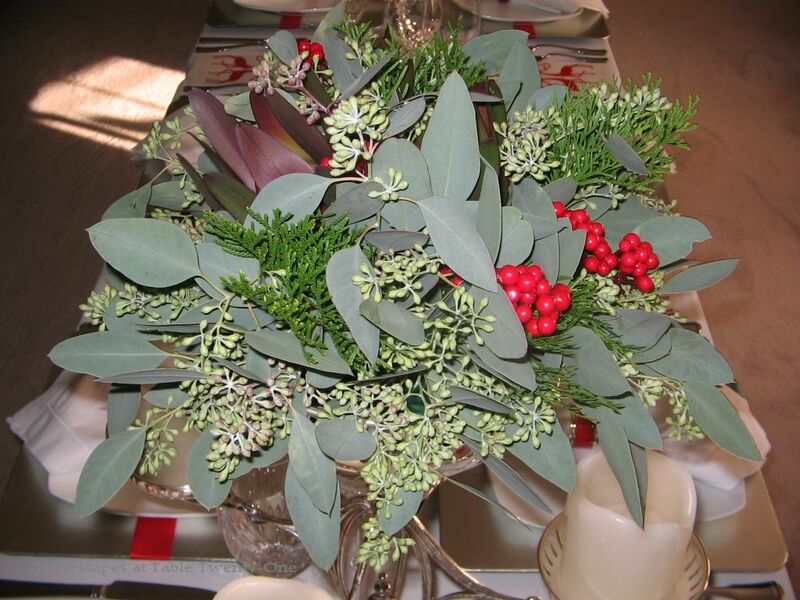 I just find seeded eucalyptus to be one of the easiest greens in the world to work with at Christmas time, so you’ll see a lot of it in my arrangements throughout the season. It drapes so beautifully and is so graceful. The greenish-grey color is wonderful, too, and it stands up nicely against the darker evergreens. My favorite filler, leucadendron, makes another appearance here along with bright red berries. Tiny crystal vases hold snippets of seeded eucalyptus, evergreens, and cheerful red berries. The fireplace mantel is all decked in a variety of greenery dotted with red berries. (Fresh seeded eucalyptus and other greens will last the entire evening without water OR you can insert the ends into water tubes.) Reflective silver candlesticks topped with pillar candles and mercury balls dance through the foliage. The whole image is doubled back in the mirror which makes it look even more lush. I’m thrilled to join Susan for Tablescape Thursdays. After clicking on the “Winter” tab above to view my photos, feel free to head on over and visit the other talented men and women there! Just beautiful Alycia! Love the snowflake as big as the plate! Very pretty. The shrimp served up on ice in the silver tray is another idea I love! Thank you, Sherry! I bought those snowflakes as tree ornaments, but have never used them for that!!! As usual, I came away from your photos all inspired! The black, white, and silver with the little splashes of red is just plain elegant. Thank you, Debbie! Even though I was a bit stressed, it was fun to do! Another home run! And the menu! Don’t know if you or the caterer fixed these items, but I bet your guests didn’t care a bit. I know I sure wouldn’t. Are you and I the only people who use menu cards or even placecards for that matter? Sometimes people will make a bit of fun of me for the menus, but I notice that they are the very people who put them in their purses as they leave! Hey there, Linda!!! Y’know…I LIKE menu cards. It gives people a heads up about what they’ll be eating and you’re right…they very often take the menu home with them as a keepsake! As for seating cards, I love them. My husband…not so much. I think it cuts down on a lot of hassle as we’re being seated. He thinks I’m being a dictator! 🙂 I did about half the cooking for this one. I was so exhausted from doing Thanksgiving for nearly 30 people, and it was hard to face the kitchen again! I wanted something special, but I didn’t want to do it all myself. The caterer is a friend (and a guest! ), so I got everything at cost which helped out the ol’ bottom line! 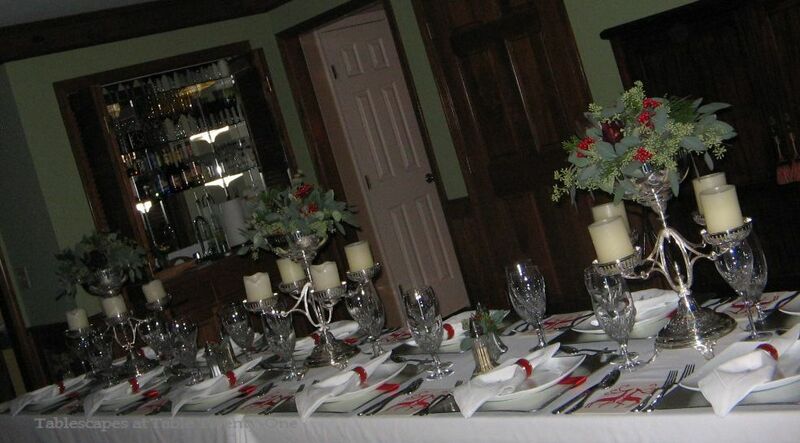 We have SIX parties scheduled for here this season. SIX!!! I’m not sure I’m going to make it! Have a great evening, and thanks for popping in! The red and silver complement each other nicely. Your place settings look like a package. I can almost smell the aroma of the eucalyptus through the screen. Being seated at one of your fabulous tables would be a gift in itself! Well done once again!! I’m in love with this table, clean and festive and your centerpieces are perfect for this elongated table. 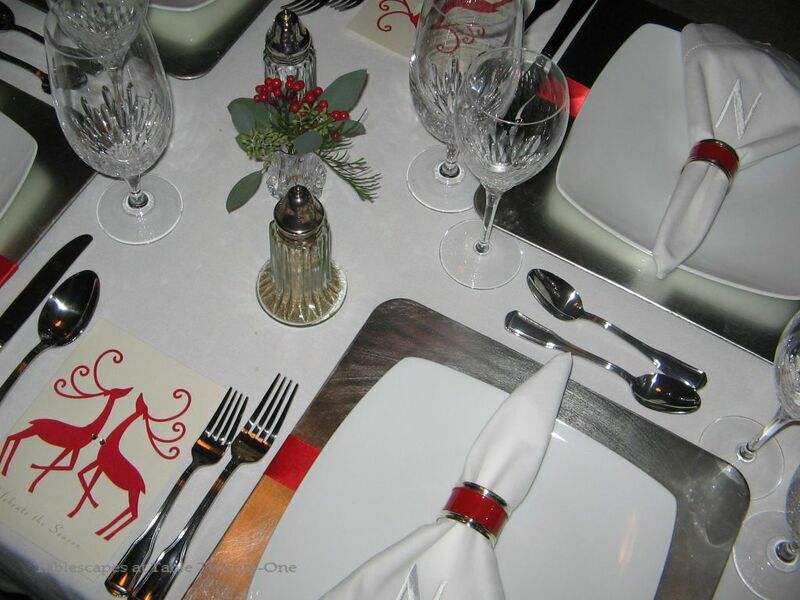 There is just enough red to make the table festive, it works well with your icy silvers. Thank you soooo much for sharing. Beautiful! I love the simple idea of a ribbon wrapped around the charger. What gorgeous and unusual chargers they are! I have used Christmas cards in the same way! They are so inexpensive and there are so many wonderful designs. To open it up and have a menu or the invitation is such a fun surprise. Yours are gorgeous and add such an elegant and modern touch of design and color to the table. It is always fun to see your tables. Oh, this table is GORGEOUS! I love the elegant simplicity of it. The silver chargers are so pretty and putting the ribbon around them is the perfect touch. I love all the silver with just a touch of red here and there. Your greenery is so pretty. I am trying to talk my husband into a eucalyptus tree because I want to be able to cut it for tablescapes. I am obviously doing a poor job at convincing him. “You want to plant a tree that you are always going to be cutting? ?” 🙂 I have to say hosting a party so close to Thanksgiving is indeed ambitious!